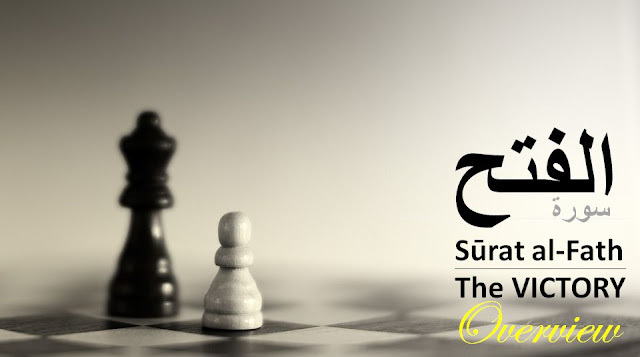 Surah Al Fath - The Victory: Overview of 48th Chapter of the Holy Quran ~ Islam My Ultimate Decision . Sūrat al-Fatḥ is the forty eighth surah with 29 ayahs with four rukus, part of the 26th Juzʼ of the Holy Qur'an. Surah Al Fath (The 48th chapter): It was revealed in Medina after the Treaty of Hudaybiyyah, and details the circumstances and terms of that treaty along with other general religious advice. The details will be covered in this post. Surah Al Hujurat (the 49th chapter): Its subject-matter is the manners to be observed by the members of the rapidly-growing Muslim community, among themselves and towards its Leader, the Prophet of Allah (peace be upon him). One may recount that while the Prophet of Allah was leaving Makkah after being coerced and even physically assaulted by the disbelievers for the propagation of Islam, he did it with a very heavy heavy heart and would often yearn to go back to Makkah, the place of his birth and the place where he was appointed on the honour of prophet hood. Thus one day the Holy Prophet saw in a dream that he had gone to Makkah with his Companions and had performed the Umrah there. Obviously, the Prophet's dream could not be a mere dream and fiction for it is a kind of Divine inspiration as Allah Himself has confirmed in verse 27 below and said that He Himself had shown that dream to His Messenger. Therefore, it was not merely a dream but a Divine inspiration which the Holy Prophet had to obey and follow. Apparently, there was no possible way of acting on this inspiration. The disbelieving Quraish had debarred the Muslims from proceeding to the Ka'bah for the past six years and no Muslim had been allowed during that period to approach the Ka'bah for the purpose of performing hajj and Umrah, the smaller pilgrimage. Therefore, it could not be expected that they would allow the Holy Prophet to enter Makkah along with a party of his Companions. If they had proceeded to Makkah in the pilgrim garments with the intention of performing Umrah, along with their arms, this would have provoked the enemy to war, and if they had proceeded unarmed, this would have meant endangering his own as well as his Companions' lives. Under conditions such as these nobody could see and suggest how the Divine inspiration could be acted upon. This blessed caravan set off from Madinah in the beginning of Dhil Qa'dah, A. H. 6. At Dhul Hulaifah they entered the pilgrims robe with the intention of Umrah, took 70 camels with collars round their necks indicating that they were sacrificial animals; kept only a sword each in sheaths, which the pilgrims to the Ka'bah were allowed to carry according to the recognized custom of Arabia, but no other weapon. Thus, the caravan set out for the Ka'bah, the House of Allah, at Makkah, chanting the prescribed slogan of Labbaik, Allahuma Labbaik meaning Here I am, O'Lord here I am. The nature of the relations between Makkah and Madinah in those days was known too well to every Arab. Just the previous year, in Shawwal A. H. 5, the Quraish mustering the united strength of the Arab tribes had invaded Madinah and the well known Battle of the Trench had taken place. It may be added that the mention of Battle of Trench has already been made in Surah Al Ahzab, the 33rd chapter / surah of the Holy Qur'an. Therefore, when the Holy Prophet along with such a large caravan set off for the home of his blood-thirsty enemy, the whole of Arabia looked up with amazement, and the people also noticed that the caravan was not going with the intention to fight but was proceeding to the House of Allah in a forbidden month in the pilgrims garb carrying sacrificial animals and was absolutely unarmed. The Quraish were confounded at this bold step taken by the Holy Prophet. Dhil-Qa'dah was one of those forbidden months which had been held as sacred for pilgrimage in Arabia for centuries. Nobody had a right to interfere with a caravan which might be coming for hajj or Umrah in the pilgrims garb in this month; so much so that even an enemy tribe could not hinder it from passing through its territory according to the recognized law of the land. The Quraish therefore were caught in a dilemma, for if they attacked this caravan from Madinah and stopped it from entering Makkah, this would arouse a clamor of protest in the whole country, and all the Arab tribes would have the misgiving that the Quraish had monopolized the Ka'bah as exclusively their own, and every tribe would be involved in the mistrust that now it depended on the will of the Quraish to allow or not to allow anyone to perform hajj or Umrah in the future and that they would stop any tribe with which they were angry from visiting the Ka'bah just as they had stopped the Madinese pilgrims. This they thought would be a grave mistake, which would cause the entire Arabia to revolt against them. But, on the other hand, if they allowed Muhammad (upon whom be Allah's peace and blessings) and his large caravan to enter their city safely, they would lose their image of power in Arabia and the people would say that they were afraid of Muhammad. At last, after a great deal of confusion, perplexity and hesitation they were overcome by their false sense of honor and for the sake of their prestige they took the decision that they would at no cost allow the caravan to enter the city of Makkah. The Holy Prophet had dispatched a man of the Bani Ka'b as a secret agent so that he may keep him fully informed of the intentions and movements of the Quraish. When the Holy Prophet reached Usfan, he brought the news that the Quraish had reached Dhi Tuwa with full preparations and they had sent Khalid bin Walid with two hundred cavalry men in advance towards Kura'al-Ghamim to intercept him. The Quraish wanted somehow to provoke the Holy Prophet's Companions into fighting so that they may tell the Arabs that those people had actually come to fight and had put on the pilgrims garments for umrah only to deceive others. Immediately on receipt of this information the Holy Prophet changed his route and following a very rugged, rocky track reached Hudaibiyah, which was situated right on the boundary of the sacred Makkan territory. Here, he was visited by Budail bin Warqa the chief of the Bani Khuza'ah, along with some men of his tribe. They asked what he had come for. The Holy Prophet replied that he and his Companions bad come only for pilgrimage to the House of Allah and for going round it in worship and not for war. The men of Khuza'ah went and told this to the Quraish chiefs and counseled them not to interfere with the pilgrims. But the Quraish were obstinate. They sent Hulays bin Alqamah, the chief of the Ahabish, to the Holy Prophet to persuade him to go back. Their object was that when Muhammad (upon whom be Allah's peace) would not listen to Hulays, he would come back disappointed and then the entire power of the Ahabish would be on their side. But when Hulays went and saw that the whole caravan had put on the pilgrims garments, had brought sacrificial camels with festive collars round their necks, and had come for doing reverence to the House of Allah and not to fight, he returned to Makkah without having any dialogue with the Holy Prophet and told the Quraish chiefs plainly that those people bad no other object but to pay a visit to the Ka'bah; if they debarred them from it, the Ahabish would not join them in that, because they had not become their allies to support them if they violated the sacred customs and traditions. Then the Quraish sent `Urwah bin Mas'ud Thaqafi; he had lengthy negotiations with the Holy Prophet in an effort to persuade him to give up his intention to enter Makkah. But the Holy Prophet gave him also the same reply that he had given to the chief of the Khuza'ah, that they had not come to fight but to do honor to the House of Allah and carry out a religious duty. Urwah went back and said to the Quraish: "I have been to the courts of the Caesar and Khosroes, and the Negus also, but by God, never have I seen any people so devoted to a king as are the Companions of Muhammad (upon whom be Allah's peace and blessings) to him. If Muhammad makes his ablutions they would not let the water thereof fall on the ground but would rub it on their bodies and clothes. Now you may decide as to what you should do." At last, the Holy Prophet sent Hadrat Uthman (may Allah be pleased with him) as his own messenger to Makkah with the message that they had not come to fight but only for pilgrimage and had brought their sacrificial camels along, and they would go back after performing the rite of pilgrimage and offering the sacrifice. But the Quraish did not agree and withheld Hadrat Uthman in the city. In the meantime a rumor spread that Hadrat Uthman had been killed; and when he did not return in time the Muslims took the rumor to be true. Now they could show no more forbearance. Entry into Makkah was different for there was no intention to use force. But when the ambassador was put to death, the Muslims had no alternative but to prepare for war. Therefore, the Holy Prophet summoned all his Companions together and took a solemn pledge from them that they would fight to death. In view of the critical occasion it was not an ordinary undertaking. The Muslims numbered only 1400 and had come without any weapons, were encamping at the boundary of Makkah, 250 miles away from their own city, and the enemy could attack them in full strength, and could surround them with its allies from the adjoining tribes as well. In spite of this, none from the caravan except one man failed to give his pledge to fight to death, and there could be no greater proof of their dedication and sincerity than that in the cause of Allah. This pledge is well known in the history of Islam as the pledge of Ridwan. 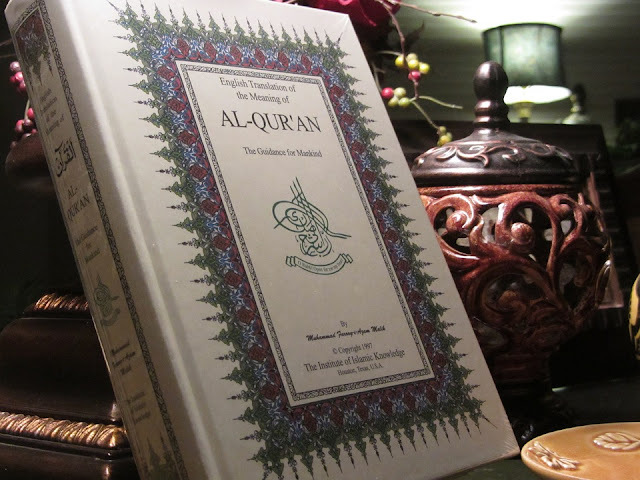 If any one during that period from among the Quraish went over to Muhammad, without his guardian's permission, he would return him to them, but if a Companion of Muhammad came over to the Quraish, they would not return him to him. Prophet Muhammad (peace be upon him) and his men would go back that year and could come the following year for Umrah and stay in Makkah for three days, provided that they brought only one sheathed sword each, and no other weapon of war. In those three days the Makkans would vacate the city for them (so that there was no chance of a clash), but they would not be allowed to take along any Makkan on return. When the conditions of the treaty were being settled, the whole of the Muslim army was feeling greatly upset. No one understood the expedience because of which the Holy Prophet was accepting the conditions. No one was far sighted enough to foresee the great benefit that was to result from this treaty. The disbelieving Quraish looked at it as their victory, and the Muslims were upset as to why they should be humiliated to accepting those mean conditions. Even a statesman of th caliber of Hadrat Umar says that he had never given way to doubt since the time he had embraced Islam but on this occasion he also could not avoid it. Impatient he went to Hadrat Abu Bakr and said "Is he (the Holy Prophet) not Allah's Messenger, and are we not Muslims, and are they not polytheists? Then, why should we agree to what is humiliating to our Faith?" He replied "O Umar, he is surely Allah's Messenger, and Allah will never make him the loser." Unsatisfied he went to the Holy Prophet himself and put the same questions to him, and he also gave him the same replies as Hadrat Abu Bakr had given. Afterwards Hadrat Umar continued to offer voluntary prayers and give aims so that Allah may pardon his insolence that he had shown towards the Holy Prophet on that occasion. Two things in the treaty were highly disturbing for the Muslims first, the second condition, about which they said that it was an expressly unfair condition, for if they had to return a fugitive from Makkah, why should not the Quraish return a fugitive from Madinah? To this the Holy Prophet replied: "What use would be he to us, who fled from us to them? May Allah keep him away from us!And if we return the one who flees to us from them, Allah will create some other way out for him." The other thing that was rankling in their minds was the fourth condition. The Muslims thought that agreeing to it meant that they were going back unsuccessful and this was humiliating. Furthermore, the question that was causing them feel upset wad that they had accepted the condition of going back without performing the pilgrimage to the Ka'bah, whereas the Holy Prophet had seen in the vision that they were performing tawaf at Makkah. To this the Holy Prophet replied that in his vision the year had not been specified. According to the treaty conditions, therefore, they would perform the tawaf the following year if it pleased Allah. When the document was finished, the Holy Prophet spoke to the Companions and told them to slaughter their sacrificial animals at that very place, shave their heads and put off the pilgrim garments, but no one moved from his place. The Holy Prophet repeated the order thrice but the Companions were so overcome by depression and dejection that they did not comply. During his entire period of apostleship on no occasion had it ever happened that he should command his Companions to do a thing and they should not hasten to comply with it. This caused him a great shock, and he repaired to his tent and expressed his grief before his wife, Hadrat Umm Salamah. She said, "You may quietly go and slaughter your own camel and call the barber and have your head shaved. After that the people would automatically do what you did and would understand that whatever decision had been taken would not be changed." Precisely the same thing happened. The people slaughtered their animals, shaved their heads or cut their hair short and put off the pilgrim garb, but their hearts were still afflicted with grief. Later, when this caravan was returning to Madinah, feeling depressed and dejected at the truce of Hudaibiyah, this Surah came down at Dajnan (or according to some others, at Kura' al-Ghamim), which told the Muslims that the treaty that they were regarding an their defeat, was indeed a great victory. After it had come down, the Holy Prophet summoned the Muslims together and said: "Today such a thing has been sent down to me, which is more valuable to me than the world and what it contains." Then be recited this Surah, especially to Hadrat Umar, for he was the one who was feeling most dejected. The signing of a no-war pact for ten years provided full peace to the Muslims, and spreading to every nook and corner of Arabia they preached Islam with such spirit and speed that within two years after Hudaibiyah the number of the people who embraced Islam far exceeded those who bad embraced it during the past 19 year or so. It was all due to this treaty that two years later when in consequence of the Quraish's violating the treaty the Holy Prophet invaded Makkah, he was accompanied by an army 10,000 strong, whereas on the occasion of Hudaibiyah only 1,400 men had joined him in the march. After the suspension of hostilities by the Quraish the Holy Prophet had the opportunity to establish and strengthen Islamic rule in the territories under him and to turn the Islamic society into a full fledged civilization and way of life by the enforcement of Islamic law. This is that great blessing about which Allah says in verse 3 of Surah Al-Ma'idah:"Today I have perfected your Religion for you and completed My blessing on you and approved Islam as the Way of Life for you." These were the blessings that the Muslims gained from the peace treaty which they were looking upon as their defeat and the Quraish as their victory. However, what had troubled the Muslims most in this treaty, was the condition about the fugitives from Makkah and Madinah, that the former would be returned and the latter would not be returned. But not much long afterwards this condition also proved to be disadvantageous for the Quraish, and experience revealed what far reaching consequences of it had the Holy Prophet fore seen and then accepted it. A few days after the treaty a Muslim of Makkah, Abu Basir, escaped from the Quraish and reached Madinah. The Quraish demanded him back and the Holy Prophet returned him to their men who had been sent from Makkah to arrest him. But while on the way to Makkah he again fled and went and sat on the road by the Red Sea shore, which the trade caravans of the Quraish took to Syria. After that every Muslim who succeeded in escaping from the Quraish would go and join Abu Basir instead of going to Madinah, until 70 men gathered there. They would attack any Quraish caravan that passed the way and cut it into pieces at last, the Quraish themselves begged the Holy Prophet to call those men to Madinah, and the condition relating to the return of the fugitives of itself became null and void.